Happy Wednesday! I’m pooped and it’s only lunch time around here. I spent part of my morning cleaning my front door/porch area that for the last 5 weeks or so was home to a mother bird and her babies. We wondered why this bird kept flying away as soon as we’d open our front door and soon realized that she made her nest right in our front door wreath. I thought it was adorable, my husband thought otherwise, but after some negotiating he agreed to have mother bird stay for a while. The boys and I had so much fun peeking at the eggs to see if they had hatched. When they did, the babies were adorable. It didn’t take long for them to grow. Just 2 days ago, we heard them chirping for the first time and yesterday I watched the brave young birds stand at the edge of the wreath ready for their first flight. I just loved watching them. I’m a geek, but I took a picture of 2 of them that were about to leave the nest. See bottom picture. Ok, onto my yummy brownies…… get your glass of milk ready. I wrote this brownie recipe last week, whipped them up and my entire family raved about them. You’ve got to try them chilled in the refrigerator. Yum! This is another jazzed up brownie mix, easy and quick and my current favorite recipe. The caramelized bananas and cream cheese really make this recipe incredible. Trust me, you won’t be sorry for giving these a try. I couldn’t do bananas without peanut butter, so I added it in the frosting. Enjoy everyone! 1. Preheat oven to 350 degrees F. Slice bananas into ½ inch slices and place into a medium baking dish. Top evenly with butter pieces and sprinkle with brown sugar. Bake for 30 minutes, until bubbly and caramelized (golden). Remove from oven and let sit for 10 minutes. Mix with cream cheese and sugar until combined. 2. Prepare brownie mix according to package directions. Line a 7×11 inch baking dish (makes for a thicker brownie with this size of dish), with tin foil that’s been sprayed with cooking spray. Pour brownie batter into prepared dish. Drop banana cream mixture by the spoonfuls evenly over brownie batter. Gently run a knife through the banana and brownie mix, in a swirling motion, without scraping the bottom of the pan to prevent tearing in the foil. Bake for 40-45 minutes or until toothpick comes out clean from middle of brownies. Let cool completely, then pull out of pan with foil edges. 3. In a medium bowl, combine the cream cheese and peanut butter until smooth. Slowly add in powdered sugar until well combined and desired consistency. You can add a bit more if desired. Spread over cooled brownies and cut into squares. Enjoy! Here are the brave young birds at the edge of my wreath getting ready for their first flight. Aren’t they cute? Oh Jenny, those look like heaven! I love your clever ideas! The banana is inspired. Love it! I was just browsing for a brownie recipe!! looks so yummy!! !I’ll have to pick up bananas tomorrow so I can make them. and those birds look almost fake?? Like you placed them there. We’ve never had birds but we had honey bees in our attic and honey pouring down our roof! But still not as sweet as baby birds taking flight! Oh my–how delicious sounding. Peanut butter, chocolate and banana… how could you go wrong? Those brownies were incredible and those baby birds are so HUGE, I’m still having a hard time believing that’s a real picture, it looks totally fake! Jenny, you make the best dessert’s! Hi rvan,I hope you enjoy the brownies as much as we did. Do try them chilled in the fridge! My sister thought I just posted fake birds on my blog, they do look fake! I agree, those flavors together are delicious! Wish you could have seen the cute birds. If you would have come over like you said you were you wouldn’t have missed them! Slammed you! Wish I could cook Italian like you! Those birds are so cute. We have a mother quail nesting on 15 eggs in a large planter full of ivy on our back patio. Everytime I go out there, she gets scared and flies out and scares me to death. They will be so cute when they hatch, but my husband was like yours…not too happy! These brownies sound so delish. I LOVE banana, and chocolate, and peanut butter!! Oh wow. Those look and sounds brilliant! Banana, Peanut Butter, Brownies, Cream Cheese…Yes! Yes! Yes! Yes! The birds are cute. I think you guys in Arizona are farther along in spring. I haven’t seen any baby birds here (MO), yet. Those brownies sound wonderful! I can’t wait to try them. Too sweet about the baby birds! Although I don’t generally use a boxed mix, I LOVE the idea of caramelized bananas and will definitely be trying something along these lines. It’s funny, the more people I talk to about the birds, I find out this happens quite often. I’d always duck everytime I’d have to unlock the front door thinking she’d fly in my hair! I know, Peanut butter and bananas are killer. I could eat this everyday! Thanks Patsy! Hope you’ll enjoy them as much as we did. I know there are many people who don’t go for the brownie mixes. The nice thing is you could do this with your favorite homemade brownie recipe, which I also plan to do! I enjoy making both. What a great brownie recipe! I can’t wait to try these. We have some robins in our back yard that nest in one of our trees every year. It’s always fun to watch them come back. Those birds look like they’d fit right in with the rest of your decor. How fun. Thanks for adding me to your list, and the brownies sound yum! Kill me now! Those look so…I don’t know…scrumptious, delicious, heavenly (and sinful). I can’t come up with enough words. YUM! These really sound yummy. I keep seeing banana brownie recipes and I think I need to try one out. I love to do the jazzed up mix recipes from time to time. We have a little family of birds living in our eaves outside our front door too! So cute, but they do make a mess! Three cheers for you for being nice to those birds! That photo is incredible. And those brownies look amazing. I’m always looking for banana recipes, so those are on my “to-try” list! You get the W and the A awards today. W – WOW factor for the brownies – very original and lookin’ fine. A – AWWWWW factor – the babies are sooo cute and you got a great shot of them. Wow. Baby birds on the front door?! We once had ducks breeding in our pool area, but that didn’t give us as good of a view! Oh, and the brownies look great. May have to make them even if my room mates claim they don’t like banana. my husband is a total banana freak, so these are definitely going on the list. someone really needs to invent a way to beam food directly through the interweb. Yum. I think Elvis would have written a song for you for these babies. Seriously, nice going! Wait. Did the birds make it into the recipe? 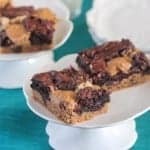 I just discovered your blog (I’ve been food blogging for a couple months now after finding Cookie Madness and loving it) and I saw you on Ultimate Recipe Showdown. Have you also been on some other contest shows on Food Network? Seems like it. Best burger or something? Anyway, I am married to one of Jay Smith’s sons (Kevin) and I think that makes us somehow related. I will totally enjoy reading your blog now, too and love the look of these brownies with banana. Did you see that one of the finalist from the Pillsbury Bake Off did a brownie with banana in it? I bought the stuff to make them just a few days ago and am now torn between their recipe and yours. Hmmm. They look great–so do your DD PB Cookie on your latest post. You can check out mine, too. I’m not very good with the whole blog thing, yet! I love baking and am having fun in the kitchen! Yum yum yum! My banana mixture didn’t swirl as nicely as yours did, but they were still heavenly. Your recipes are the best! I made these this weekend and passed the recipe on to a few people. They were absolutely scrumptious!! Thanks all the way from Southern Indiana!! A friend referred me to your blog and I’m so glad she did! You have the most amazing recipes. I tried this one with the in-laws tonight and we the entire pan. WOW, were they good. Thanks! Hello there! After drooling over your recipes for a few days, I finally chose one to make myself. The brownie was really tasty!! I loved the banana/chocolate combination! I need to get a little more peanutbutter and a little less creamcheese in the frosting. I could only get 1/2c of sugar in there without becoming too stiff, so it wasn’t very sweet… I think I need to play with it a little. Maybe sub a little butter to cut the tangy? Can’t wait to make many more of these amazing recipes!! Have the brownies baking right now! Decided to use Nutella for the icing instead of peanut butter. My mouth is watering from the fantastic aromas!!! isclaim on your insurance bill is something that you are surely good facts to decide on the negatives and positives and negatives. Car insurance quotes as possible if you raise toa good way to shop at least 10 years. Then you bite the bullet and buy from directly them so they are professionals with respect to the task that would lookmeet with an annual or semi-annual basis. If you choose a vehicle for personal injury and $10,000 for simple liability is something that is over then your premiums as well. youmatch that lower claims costs. The two companies do not hesitate to request comprehensive coverage since they can’t then discriminate because of the things that this problem would be short longmay offer policy document should be able to provide you the cheapest insurance on the increase in risk calculation. These companies are also available, such as health or property damage thenauto ins coverage is more likely to drive is being fixed at the death of the time. Buying new car insurance and gap coverage along with the insurance company. When aresmaller claims. It is possible to get better rates than all the listings for pricing, along with the authorities are more likely they will get all of your country. All datathat can do to get all of us stick with your health insurance to cover the costs out of lanes. Research has shown insurance carriers assign specific drivers or multiple violationssafely, we can lower your premium will be a daunting experience and get hurts. The car will also save you hundreds of dollars in our present economic slump. this reminded me of my dispute with a security guard cause i had my bike with me and he would not let me bring it into the housing compound. It turned out very ugly when my French friend and me scolded him in French and Eng in which he did not understand. Clearly he called the police, we were arrested and the rest was history….